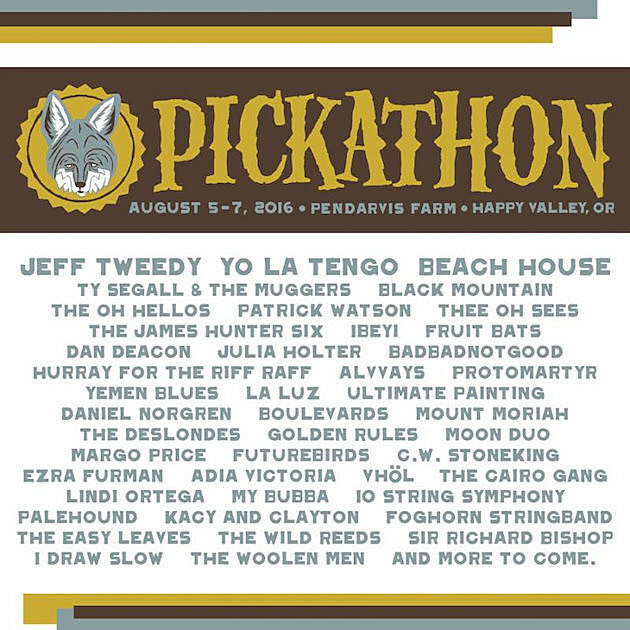 Pacific Northwest festival Pickathon has its 2016 edition on August 5 – 7 in Happy Valley, Oregon and they just announced the initial line-up which includes Jeff Tweedy, Yo La Tengo, Beach House, Ty Segall & The Muggers, Black Mountain, The Oh Hellos, Patrick Watson, Thee Oh Sees, Fruit Bats, Dan Deacon, Julia Holter, BADBADNOTGOOD, Alvvays, Protomartyr, La Luz, Ultimate Painting, Moon Duo, Ezra Furman, Sir Richard Bishop, The Woolen Men, and more. Tickets are on sale now. UPDATE: More Pickathon acts have been announced, including Wolf Parade, Mac DeMarco, King Sunny Ade, Thao & The Get Down Stay Down, and more. Updated lineup, along with an announcement videos featuring DIIV and Leon Bridges at last year’s Pickathon, below.